Here is my progress thus far. I'm liking the way it looks, though I will admit to being curious to see how the sleeves will end up attached to the body of the sweater. But a little mystery is a good thing, right? It's a pleasant knit, and a good one to work on while watching/listening to podcasts, or if you just want to knit but don't want to concentrate intensely. My current read is also pleasing to me. I decided to read this book when Sue of High Heels in the Wilderness mentioned it - she has never steered me wrong so far! I'm approximately halfway through, and enjoying it so much that I am purposely not reading it all of the time, so it will last. Though I will have to finish before it's due back at the library! 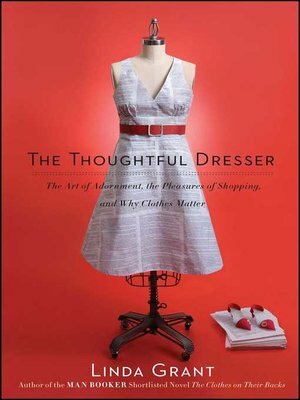 I love how the writer discusses the way that what we wear can influence our feelings, our confidence, and how style is not fashion, etc. It's very well-written, and each chapter is one that could stand on its own as an essay. I haven't started my April pair of socks yet, but I'm thinking they will be a shortie pair. I finally wore the shortie pair I knit last year over the weekend, and wow - handknit shortie socks are a whole 'nother story from store-bought! I should have known that, but to be honest, I just figured that short socks were never terribly comfy because they didn't cover any of your leg. More the fool am I. And that's my story for today. I'm joining in with Kat and the others for Unraveled Wednesdays - stop over and see what everyone else is reading and knitting! Even though I am hoping spring is just around the corner, I've had the itch to start a sweater. I didn't even unpack the ones I have this year as we went right from the tropics to the arctic and now I am afraid back again. What ever happened to sweater weather? Ooh, thanks for the book recommendation! I just put in a hold request at the library. 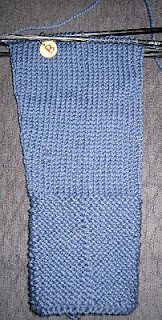 Short-cuffed socks (I knit a two-inch cuff) are perfect for summer wear. I need to knit a pair or two this year. That looks like a great book, one I could really use. I don't dress for style or fashion, but mainly comfort. That's fine since I'm at home much of the time, but problems begin when I have to go someplace/do something where what I'm wearing really matters. Thanks; I've placed a hold, too! Ooo! I have just increased my "to read" list! Thank you! There will probably be shortie socks in my box o' sox too. I have two skeins that are "short" of yardage. You'll have to let me know how yours go. Love the garter cuff on your sleeve! The book looks interesting but I'm afraid what it would say about my usual dress code of yoga pants and a sweatshirt, jeans if I'm feeling dressy. :) Yikes!